The Heritage Lottery Fund (HLF) has today announced significant National Lottery funding to help train a new generation of clock and watchmakers in the UK. HLF has awarded the British Horological Institute (BHI) – a membership organisation for people who make, repair, collect and sell clocks, watches and other timepieces – a grant to create a National Centre for Horology at its Upton Hall base, near Newark in Nottinghamshire. The Centre, due for opening in 2018, will address the nationwide shortage of horologists by creating new training and workshop facilities in a derelict stable block and glass house, allowing the BHI to double the number of students it trains a year. Historic England has included Upton Hall – a Grade II* listed building – in its 2015 Heritage at Risk Register. HLF has earmarked £2,852,600 for the project including a Development Grant of £160,300, which the BHI will use to progress plans, produce a fully costed proposal, apply for planning permission, and submit a second round application, when the full grant amount will be released. The Centre will be open daily and the public will be able to view students at work and visit exhibitions with key pieces from the BHI collection, which includes clocks going back to the 17th century, watches such as the timepiece carried by Captain Scott on his ill-fated expedition to the Antarctic, and the first two Speaking Clocks. The historic main building at Upton Hall will also be developed and access to the collection will increase significantly with volunteer support and extended opening hours. The Centre anticipates thousands of visitors annually, including hundreds of schoolchildren for whom special education areas will be set up. Collected from 1858, there are currently over 1,000 artefacts on display and stored in the reserve collection of the BHI, and as such it is unrivalled in the UK but currently only open for public view three times a year. 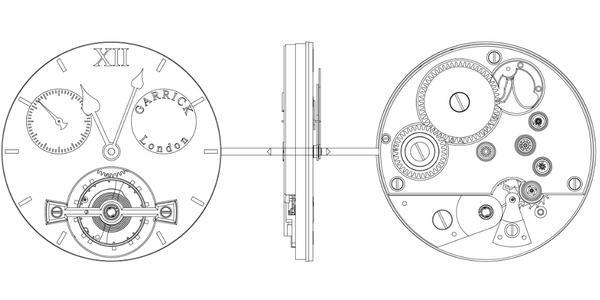 movement to display the Garrick balance through the dial. From this entry you will see he is a pretty talented watchmaker his most recent recognition being in 2013 he was awarded the Prix Gaïa of the International Museum of Horology (MIH) in La Chaux-de-Fonds in the category artesanat-création for his technical and artistic creations. All will be revealed at the Salon QP in November. Here is a great article on Monochrome. An interview with David Brailsford the founder of Garrick Watches discussing his favorite watch. Two British brands in one story, happy days. I suggest you look at the full article following this link. For anyone in a hurry a lot of it is below. This week, on the Collector’s Series, we discover what it’s like to own a watch that, when released, was the first wristwatch to have all five hands all mounted on the same central axis. This unusual watch is called the Concentrique Grand Complication 5 and is the work of one of the greatest British watchmakers, Peter Roberts. Fitted with a superbly finished Valjoux 88 as a base, it boasts many complications, something that its owner, David from Garrick Watches, knows how to appreciate. And as usual, there is a story behind a watch, and here is David’s. Peter Roberts is one of the great veterans of British Watchmaking. He has spent 45 years in the business having been the the first British student to attend the Swiss WOSTEP course (the Watches Of Switzerland Training and Education Program, which was founded in 1966 and is considered the basis for modern education in horology for professional watchmakers). He has worked at IWC, Rolex, and more recently, British watch brand Bremont. 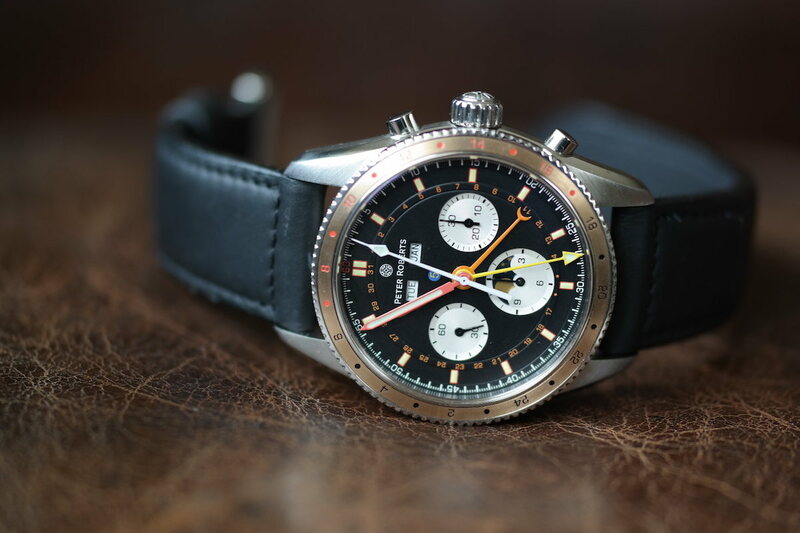 This week we had the opportunity to talk to Garrick Watches founder, David Brailsford to understand why he cherishes his Peter Roberts Concentrique so very much. 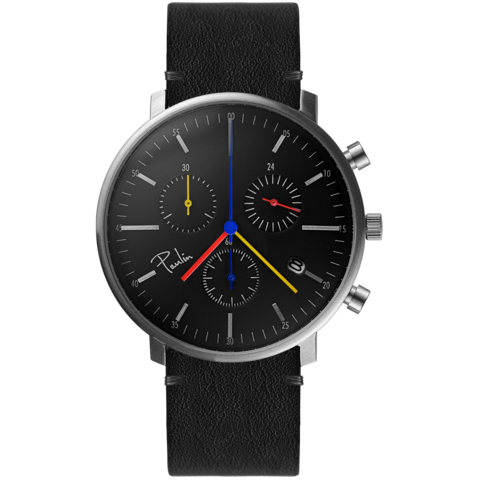 The Concentrique was Roberts first chronograph having created it at the tender age of 20. It was his graduation project at WOSTEP. In 1972 it was the world’s first wristwatch with with five hands all mounted on the same central axis. It is without doubt a complicated timepiece, which at its core has a Valjoux 726 chronograph movement base (the new Concentrique has a Valjoux 88 as base movement). David founded Garrick in 2014 and they manufacture fine watches in their dedicated facility in Norfolk, United Kingdom. The brand was born out of an innate need to patriotically champion home-grown talent and create a new chapter in British watchmaking history. This isn’t marketing hyperbole, but the understandable patriotic motivation of a team who wish to write their own chapter in Britain’s horological annals. When did you get into watches Dave? From an early age, I always had a fascination with mechanical objects, especially watches. 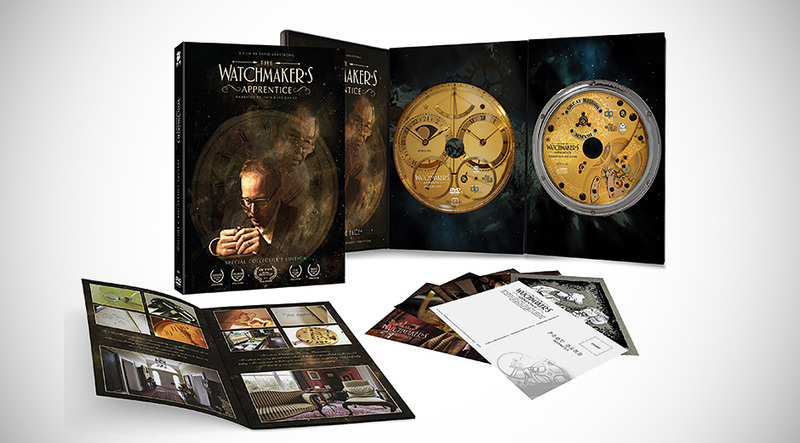 What was it about watches that intrigued you? I continue to find the near microscopic scale of components incredible, especially when you consider the way these tiny parts collaborate seamlessly to impart time. Indeed, I still marvel at the sight of a time-served watchmaker working at the bench, deftly manipulating tools. It is partly for this reason that I am enchanted by fine watchmaking. Mr Roberts is a fascinating gentleman and has had a huge impact in the watch world, can you tell us more? Peter Roberts remains a watchmaker whom I greatly admire. He has trained some incredible watchmaking talents over the years, including Stephen Forsey, Peter Speake-Marin and our very own Simon Michlmayr. Furthermore, whilst these highly accomplished British watchmakers have all attended WOSTEP in Neuchâtel, Peter was the first, paving the way for his younger compatriots. Finally, despite having an impressive breadth of talents, he has retained a refreshing modesty and is a thoroughly decent gentleman. When did you come to own the Concentrique? I purchased my watch, number 002, in 2013. It remains one of my most prized possessions. What was it about the Concentrique that caught your eye? I thought the watch was aesthetically stunning. Moreover, I adored the story which lay behind the Concentrique. Originally, Peter saw a watch in a reference book, equipped with five co-axially positioned hands whilst he was a student at WOSTEP. Peter spoke to his lecturer who said the watch was merely theoretical and had never been produced. 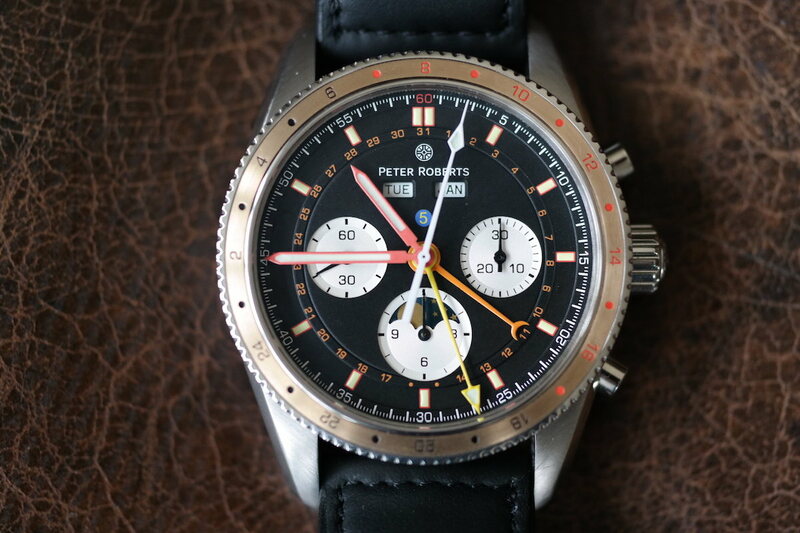 It was this comment which spurred on Peter and led to him creating his 5-hand timepiece. The original featured a Valjoux 726 together with some Rolex components and Peter continues to wear this watch to this day. 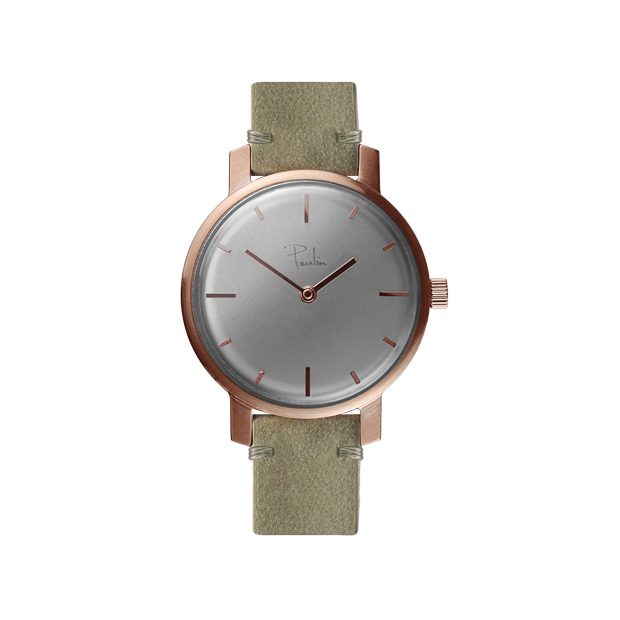 I would love to own this very watch. I adore the slender bezel and the beryllium bezel insert. What’s inside the watch Dave? A new-old-stock Valjoux 88 (a moon-phase / triple calendar edition of the Valjoux 72) with unique Concentrique mechanism. The movement has been wonderfully reworked by Peter and the finishing is sublime. Absolutely! I often wear the Concentrique and whilst I possess other watches, this is one of my favourites. What is more important to you when buying a watch, brand heritage, accuracy or aesthetic? A watch may appeal to me for several reasons. It has to be aesthetically pleasing and deliver precision but, most of all, it has to engage with me on an emotional level. A timepiece should ignite passion in the wearer and make them smile every time they wear it. What, if anything have you got your eye on next? I am a typical watch collector, there is never just one watch! I appreciate watches which allow me to see the balance at play and reveal a finely executed movement. There are two watches I am considering at the moment, the Maurice Lacroix Masterpiece Gravity and the Breguet La Tradition. They both are wonderful examples of watches that engender passion and wonderfully reveal their Swiss lever escapements to glorious effect. What three words would you use to describe your Peter Roberts Concentrique? Only three words! “Personal”, “craftsmanship” and “passion”. 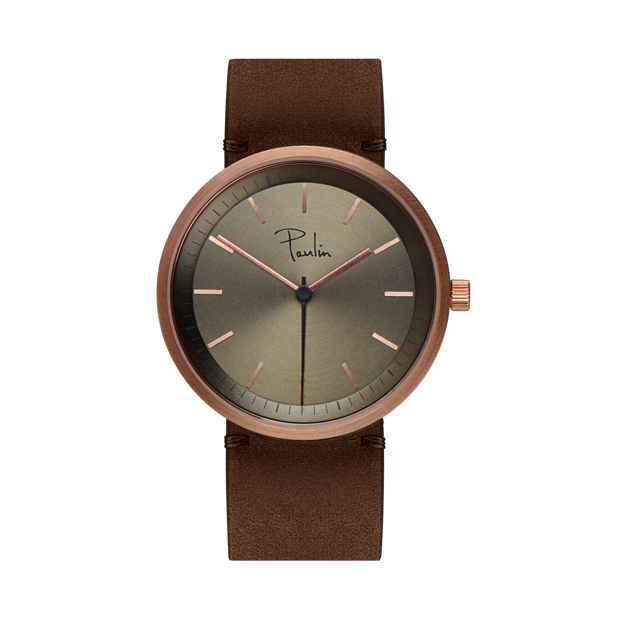 After reading the brief description of Paulin watch’s Glasgow based company in the Economia article I blogged on October 5th I had look at their website today. At the moment their range all designed and assembled in Glasgow consists of variations three series, the C200, S75 and C50. The one comment I would make is that the movement used according to their website are Miyota, so Japanese not Swiss as mentioned in the earlier article.